"The power of the Vault flows through the Templar." 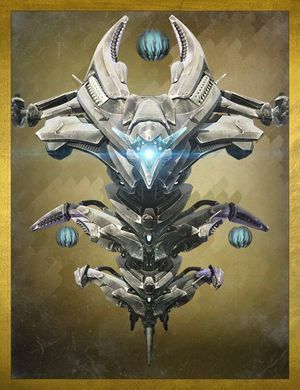 The Templar is an extremely powerful Vex Hydra found in the Vault of Glass. Unlike normal Axis Minds, the Templar is unique in it being a creature out of time, and can thus manipulate reality in according to the Oracles' design. It, along with the Oracles, guards the way to the deeper sections of the Vault. The Templar is the first boss in the Vault of Glass and has arguably the most complex encounter in that it requires players to multi-task and focus what is happening at several locations simultaneously. The first part of the fight starts when all six Guardians drop down into the Templar's Well. The Templar will spawn, but will be completely immune to damage thanks to its shield, which protects its entire chassis. It will also fire its Aeon Maul to suppress players and keep them them behind cover. While this occurs, confluxes will show up in the left, middle and right of the arena. These confluxes must be defended from all Vex that approach them. Once 4 Vex units sacrifice themselves to any of the confluxes, the Templar will have a sufficient power level to expunge the entire raid team, immediately wiping them. The players will not only have to focus on defending the confluxes, but the Templar will also summon unique Vex units named Fanatics, which, when killed or get too close to you, leave behind a large green circle. Players should avoid stepping in these circles, for if they do, they will be marked for negation. If a player is marked for negation, they must run to the pool of Light in the center of the arena to cleanse themselves, or they will instantly be killed when the Templar performs the Ritual of Negation. Once the raid team has successfully defended the confluxes from Vex sacrifices, the Templar will then summon its Oracles. If any of these Oracles are not destroyed, all players will be marked for negation, which again means that they will instantly die when the Ritual of Negation is performed, unless they rush towards the aforementioned pool of Light. In order to make sure these Oracles are not destroyed, the Templar will summon Vex reinforcements that will inundate the player's field of view. This, combined with constant spawning of large numbers of Oracles, make this part the longest section of the encounter. After several of its Oracles have been destroyed, the Templar will then begin to face the Guardians personally. Picking up the Aegis Relic in the center of the arena will cause the Templar to start attacking all players in sight. The player holding the relic is the key to completing this encounter, as the relic's Super attack is the only way to break down the Templar's circular shield. As reinforcements try to take down any players on the move, the Templar will summon more Oracles. Again, the entire party will be marked for negation if they fail to destroy the Oracles. The difference here is that there is no more pool of Light. Instead, everyone has to group up on the relic holder and be cleansed by the Aegis. Once the relic holder has gained a fully charged Super, they can then bring the Templar's shield down. However, this causes the Templar to summon detainment bubbles around two players at random as it attempts to teleport. These detainment bubbles must be destroyed with normal weapons. Moving out of them will cause the Templar to inflict them with the Suppression Field debuff, which will kill them quickly. Destroying the bubbles with rockets and/or grenades will often cause serious or even fatal damage to the victim. Otherwise, if all team members are free, they all must quickly pump damage into the Templar. This process repeats until it is finally killed. With the updated version of Vault of Glass, the Templar gained some new mechanics. It will have turned certain safe spots into either timed death zones or completely inaccessible areas. This is meant to force players into the open and face the enemies directly. In addition, when players are defending the confluxes and fending off the Oracles, the Templar will periodically summon Supplicants, which are Harpys that fly very fast and will explode when they get too close. But perhaps the most significant change of all is that during the third section, the Templar's Oracles will be red instead of yellow, meaning that if one is missed, then the Templar will inflict the Prophecy of Doom debuff on all Guardians, draining them of their Super and then killing them all. In Templar's challenge, The Templar must not be allowed to be teleport at all, meaning that The Templar must be defeated in a single damage phase.